REINVIGORATED leading up to the new year, Mazda has tweaked its large load-lugging sports utility vehicle. With the Japanese car maker's mid-size CX-5 enjoying strong growth - and set to get stronger next year, once a brawnier petrol is added to the range - the larger CX-9 has been updated to keep it competitive in the genre. The starting price is up by $100 to $44,525 for the base two-wheel drive, but mid-spec offerings are down by $1345. Most would struggle to pick the difference between this model and its predecessor, although the exterior has been massaged to include new bumpers front and rear, while the grille has been updated to incorporate the new "wing" logo. Nothing has changed under the bonnet, with the seven-seater powered by a V6 engine, while matched to a six-speed automatic transmission. Spacious and quiet, all grades from Classic, Luxury and tree-topping Grand Touring are generous in feel and specification. New piano black finishes on the dash and Tom Tom sat nav functionality add some class. Range-topping models have suede and red stitching on parts of the door trim and seats with black leather trim. Seven adults can be accommodated, although the third row has limited head- and leg room. While three zone air-con is standard, there is no vent in the back for those who draw the third row short straw. The pews up front are nicely supportive, and there is ample steering wheel and seat adjustment for the driver. Only one engine variant is available across the range: the hairy-chested V6 mated to a six-speed automatic. The bent six does a good job of hauling the large SUV's frame and is happy to rev when prompted. Given the proliferation of steering wheel paddle shifters nowadays, the CX-9 feels somewhat naked without them - although you do have the option of manual changes by throwing the shifter across and shunting it backward or forward. There are two or all-wheel drive derivatives, yet most drivers would struggle to detect the difference. It is Mazda's largest car and while it feels planted on the bitumen and gravel, push it hard on the twisties and it starts to feel every centimetre of its dimensions and two-tonne kerb weight, as body roll rears its head. Standard kit includes alloys, cruise control, Bluetooth connectivity, MP3 compatible CD player and reversing camera. Luxury variants gain a sunroof, power adjustment of front seats, Bose stereo, Tom Tom sat nav and leather trim. The Grand Touring model adds Bi-Xenon headlamps, power tailgate, keyless entry, parking sensors and engine start. Mazda has also introduced the availability of "i-ACTIVSENSE" on the Grand Touring, which includes blind spot monitoring, forward obstruction warning and lane departure warning - but no radar cruise control. Among those in this genre are the Toyota Kluger (from $39,990), Hyundai Santa Fe (from $36,990), Kia Sorento (from $37,490), Holden Captiva 7 (from $27,990) and the Ford Territory (from $39,990). For those who have to cart a netball team, or just like to separate the kids, the seven seats provide great flexibility. Collapsing and deploying the seats is simple - there is even space for a few bags with all three rows in use. 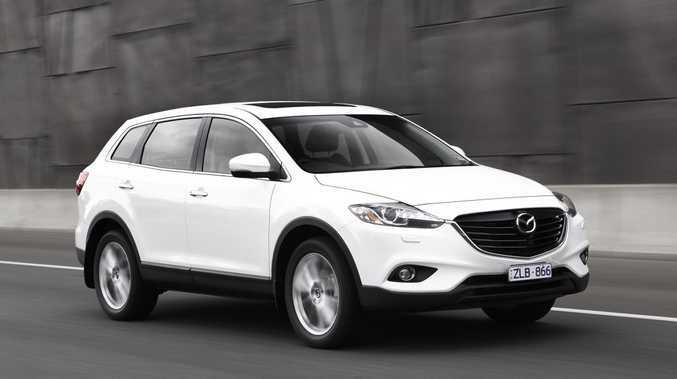 The CX-9 also has a 2000kg towing capacity. Fuel consumption is the greatest bugbear for the CX-9. It averages about 11 litres for every 100km. But insurance and servicing should be at the lower end of the scale. Mazda has little need to alter the exterior - it's one of the more alluring large SUVs around. The new grille provides greater presence featuring the Mazda "wing", while LED daytime running lamps on the Grand Touring models and a halo ring around the rear tail lights are nice new touches. Sales of the CX-9 remain strong, and these tweaks and additions maintain its competitive position. A diesel variant would no doubt be welcomed by Mazda to give the big SUV a shot in the sales arm. Spacious, well appointed and quiet on the road, it's an easy large SUV to live with. The good stuff: Spacious cabin, quiet ride, seven-seat flexibility. What we'd like to see: Improved fuel consumption, diesel engine option. Details: Five-door two or all-wheel drive large sports utility vehicle. Engine: 3.7-litre V6 petrol, generating maximum power of 204kW @ 6250rpm and peak torque of 367Nm @ 4250rpm. Consumption: 11.0 litres/100km (FWD); 11.2L/100km. Bottom line: FWD Classic $44,525; FWD Luxury $52,980; AWD Luxury $57,480; AWD Grand Touring $63,828.